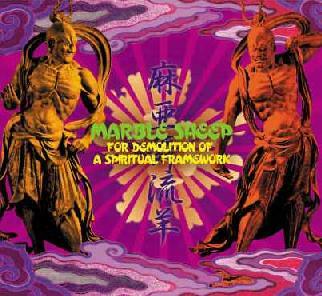 Marble Sheep - "For Demolition Of A Spiritual Framework"
Starting right away from a Japanese garden scenery this CD by the Tokyo based psycho and improv rockers Marble Sheep shoots you right on to a highly adventurous orbit crisscrossing all the well known routes of all kinds of musical satellites and spacecrafts to reach their very own place in the stratosphere of the contemporary musical underground. Underground? Well, being told that this would be a major release of an upcoming new big thing promoted by the music industry you would probably believe it. Headbanging monster Rock for big stadium festivals at the first listen, Marble Sheep definitely do achieve a most sophisticated amalgam of mass compatability (sonically and energetically) and all the virtues of independent and alternative underground credibility (musically and in its general attidude). A watery and bubbling soundscape intro of a garden fountain sets up the environement for "Old Fish", the instrumental opener, which like the overture of an opera tunes you in for the very own world of this CD, spun hippie chords, breaks to take breath that lead over to new musical perspectives, playing with guitar effects and a double soloing of both lead guitarists backed up by two drummers... Next is "Fla Fla Heaven", a roughly shouted tune, straight unilinear Rock with a high recognizability which should lead to become one of those "minor hits" at least, that are sometimes still achieved by independent releases. "The Drop" is very much like one of those mind expanding journeys that were quite common in the Seventies psychedlic Rock - you can let yourself be carried away by this tune with one listen, and you can detect a very delicate and demanding "deep stucture" with thrilling interactions of all instruments during this eleven and a half minute trip with the next. "The Night Of The Shooting Star" gives you a bit of recreation as it starts like a real "song" - coming with verse, bridge and chorus it reminded me a bit of a Sixties Hippie Folk ballad. Track five, played on percussion exclusively, exhibits the mentioned Japanese garden scenery best, and it leads over to "Rain", the centerpiece of the whole album. "Rain" starts like a rehearsal room improvisation on a rather "low discipline" level, but it’s catchy enough to hold your attention awake until you detect the compositional masterpiece that it is - some time around seven thirty the scenery changes completely coming with a folk like clean guitar that accompanies a four line poem ("The last soldier on his knees / Final Rain falls on his head / Washing away, washing away / We are praying for the coming new world") which is followed by one of these extremely rare melody lines that don’t get boring even when played for hours (and the whole tune gave me the impression of a journey starting off at the Japanese East coast leading right into a summer open air festival on the US West coast...). "Legend Of The Perfect Island" again exhibits the band’s songwriting skills - imagine a Sixties folk song mixed up with bar Jazz and psychedelic guitars... a perfect tune for any sunset in any season in any region of this world. The CD closes with "Just Going Round In Circles", and this is exactly what you get: a modulation of one chord that's just going round in circles for seven and a half minutes, but there are subtle changes in its sonic structure, and even a bit of percussion is added. An introduction of this band to Aural Innovations readers would be incomplete without saying that Marble Sheep are not a new band. Founded in 1987 by Ken Matsutani, the founder and owner of Captain Trip Records, you can track back their recorded works to 1990, among them them the "Whirl Live" live double CD from 1990, their appearance on the "Kick Off The Jams" Korea/Japan independent label festival in 2001, "Stone Marby", the predecessor of "For Demolition..." from 2001, and many more. Coming from the Eighties Japanese avant-garde and experimental improvisation scene, and after quite a few changes in their line up since then, Marble Sheep today can suitably be mentioned in one take of breath together with The Boredoms, White Heaven or Acid Mothers Temple. If you want to keep track with the latest developments in the international psychedelic music scene you won’t want to miss their albums. "For Demolition Of A Spiritual Framework" is a pretty good starter. Visit the Marble Sheep website at http://www.soho-net.ne.jp/~ohr/index-e.htm, and the Captain Trip website at http://plaza14.mbn.or.jp/~captaintrip/egs.html.